Yo, i was back on the boards in 1998. Now I have a 92 VR4. Any old timers still around? thanks. bought it from a member who thought motor was blown. I never told him until now. The dealer misdiagnosed a faulty oil pressure sending unit. Not quite as long as you, but have been around since 2004. View our 3.5 Liter DR750 E85 AEM 1995 Dodge Stealth R/T Turbo Subscribe to our YouTube Channel! FIC Fuel injection, Walbro, Snow Performance, OEM Mitsubishi Parts, Getrag Parts, Synchros, much more! Cant we all just smile and get along? Motor: All forged internals, Fluidamper, Stge 3 heads, Stg 2 cams, 3SX S/S headers, 3SX Executioners V2, CSX racing SMIC, 760 injectors, 70mm TB, Jester MAF, Aeromotive fuel pump, water & methanol injection, oversized baffled sump, Jester and AEM ECUs, 3SX fuel rail, Mishimoto radiator, competition clutch on 14lb flywheel, Tanabe 3" turbo-back. Is it me, or did you used to have a rather attractive blonde in a similar picture? 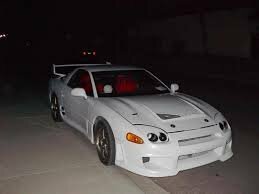 I never forget a beautiful.....mmmmm.....car, that's it! 92 Wheat Beige Metallic Stealth TT..Winter DD!! Last edited by OhioSpyderman; 04-06-2019 at 03:17 PM.